Even after the Scythe and Teacups marathon tournament I'm still hungry for my games. My hobby mojo may be on the wane a little bit but when Ben asked my for a game I wasn't about to refuse. I decided to not take the Doom, instead I went for two Flyrants, two Spore Pods with 10 Devgaunts each, two Tervigons and a Biovore and Bastion with a Mawloc. 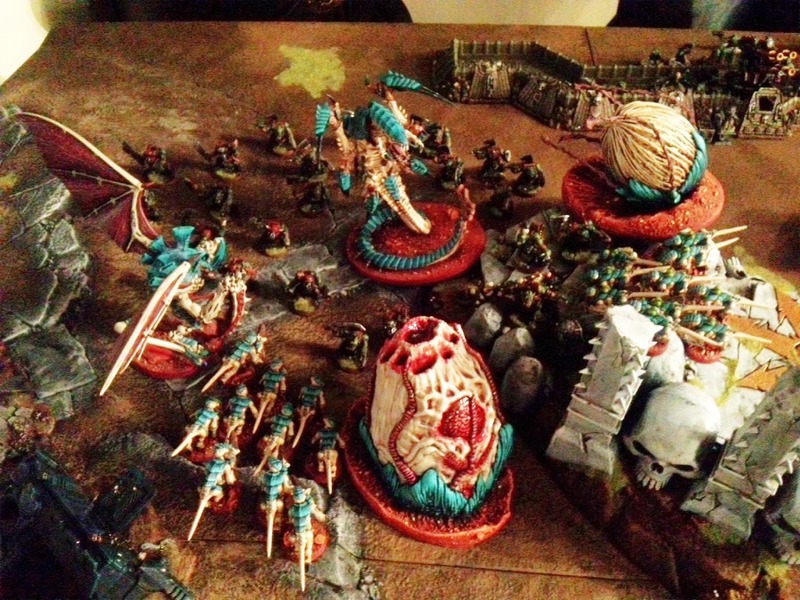 Altogether quite a compact if monstrous force with no HIve Guard either! 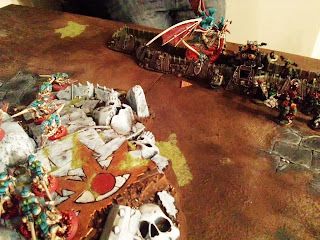 Ben intimated he would be taking two flyers, which given how successful one Dakkajet had been in bringing down my Flyrant I expected them to do just as well and I actually spent a lot of time running it through my head how I was going to counter that threat. In all honesty that was NOT how I wanted to play. 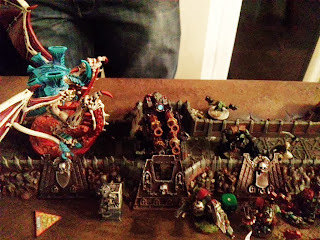 After a days competitive gaming I really wanted a fun bash and was secretly hoping to lose in as much disastrous flames and choppiness as the Orks could provide. Warlord Trait - Re-roll reserves. 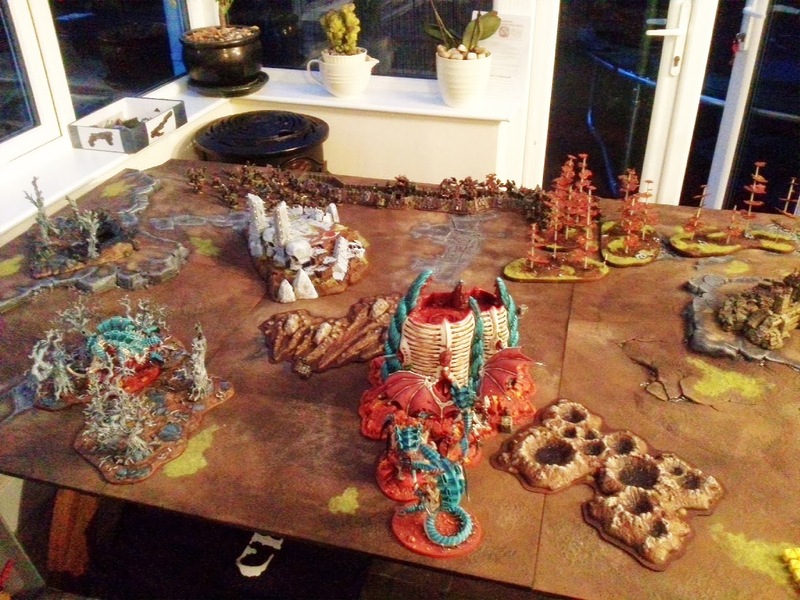 So, board setup, my Tervigon on the left flank nearly went unnoticed by Ben ;) I have a 1pt objective behind the Bastion - next to the meteor crater. There's a a 3pt objective to the left of the bastion behind the other meteor crater and my 3pt objective is just in front of the trees my Tervigon is hiding in. This big mob of Orks is led by the special character weirdboy that can turn Independent Characters into Squigs. A 4pt objective is just out of shot below on the chaos shrine. 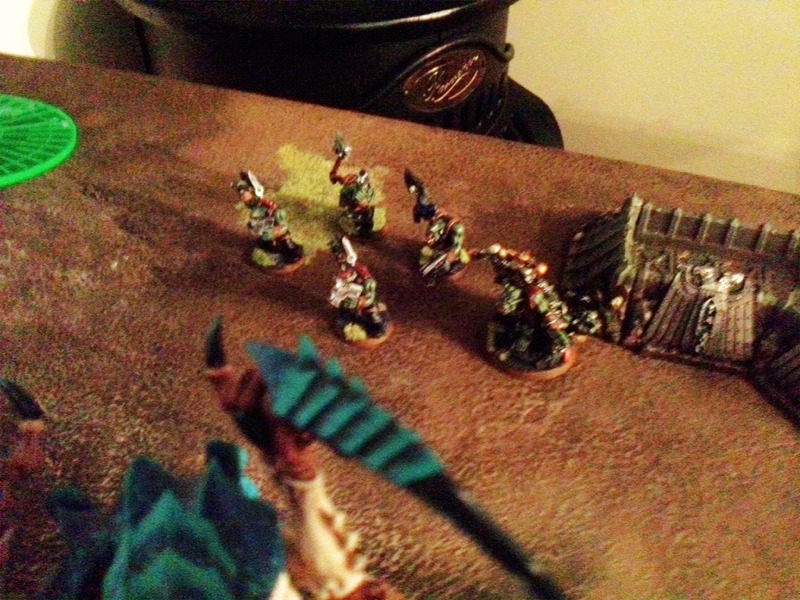 Ben's 'borrowed' Defence Line with Ghazkhull Thrakka leading the greenskins. 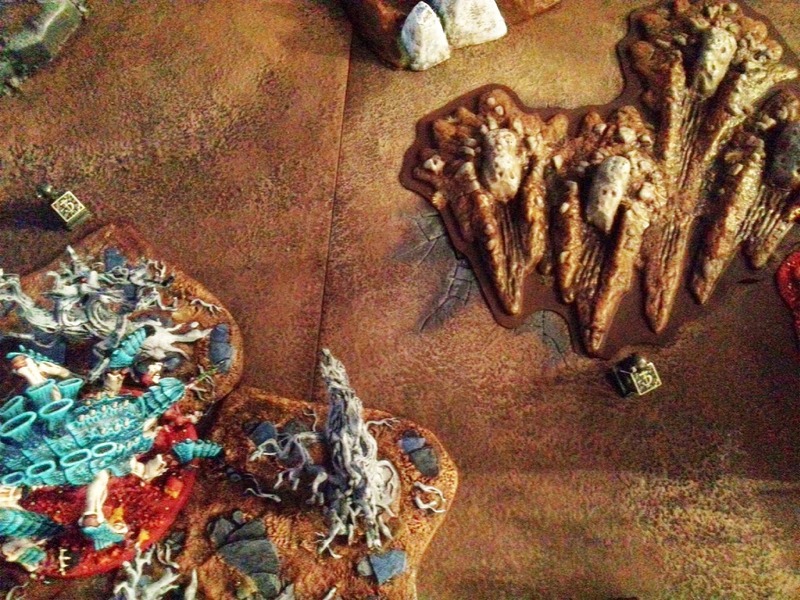 A 2pt objective is on the left in front of the Aegis and there's another 2pt objective out of shot on the right. So Ben had got 8pts to my 7pts. Turn 1 and the Orks move forwards. Some shooting happened but it was practically ineffective with I thin zero damage taken. 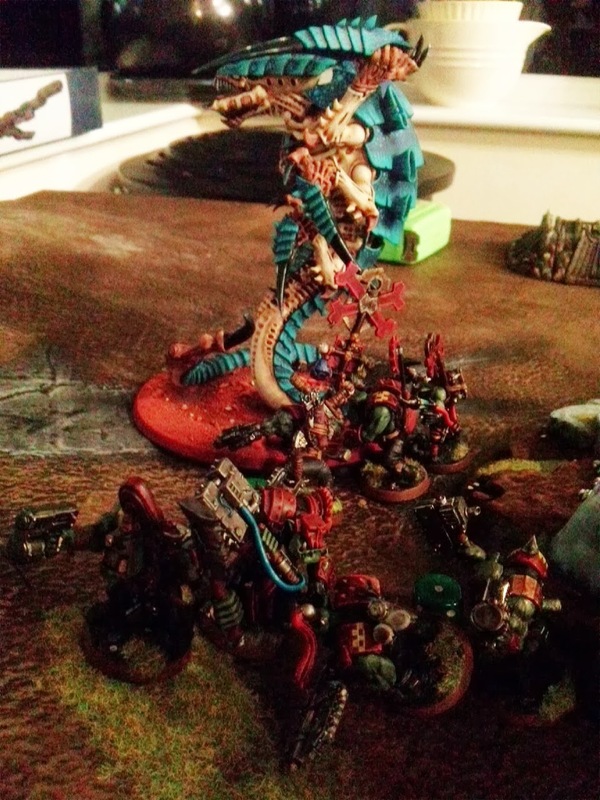 CC Tervigon spawned 9 and headed for the onjective - a Grav Wave Generator. 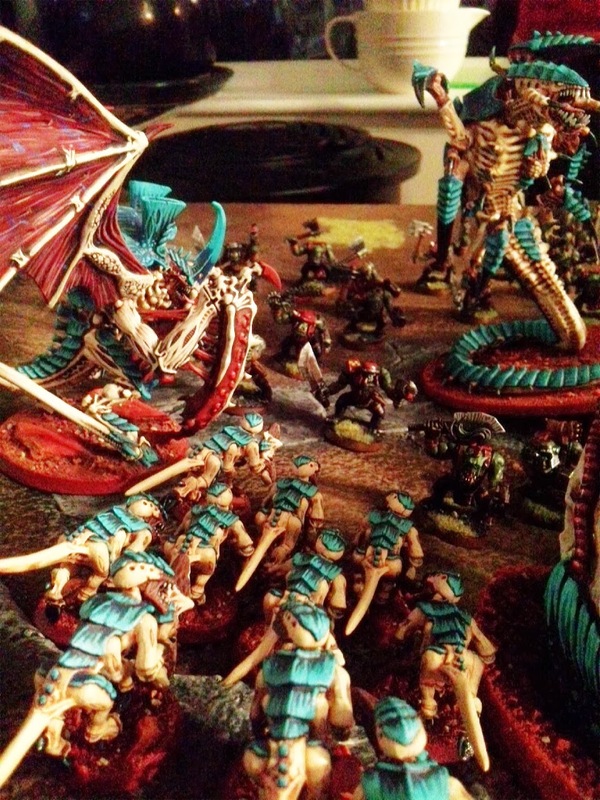 Vanilla Tervigon spawned out on 14 held the targetting relay. 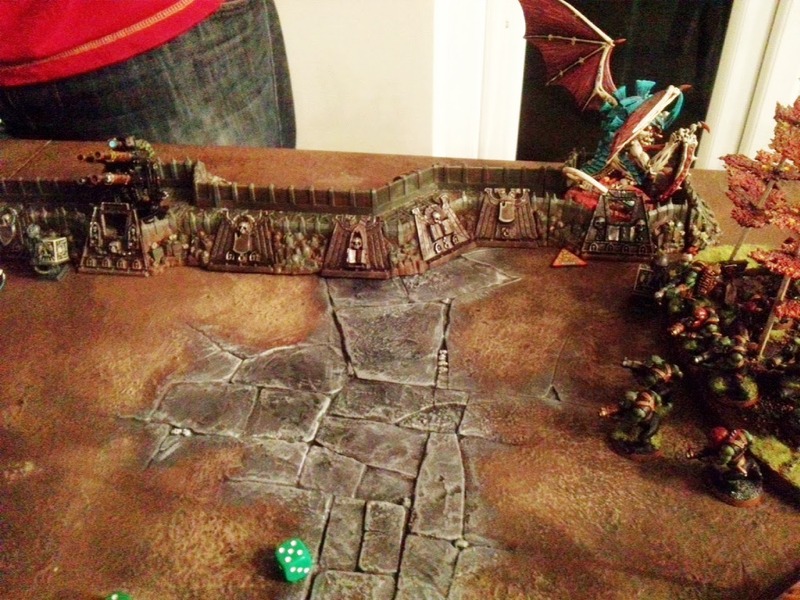 The Mawloc burrowed and Biovore entered the Bastion, while the Tervigon and Flyrant waited for their chance. Well that was unexpected! 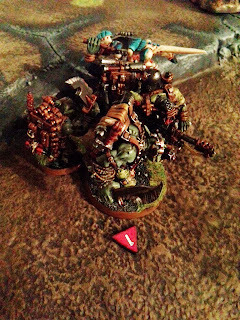 Ben's Ork Kommandos had a special character that allowed them to outflank from any baord edge. 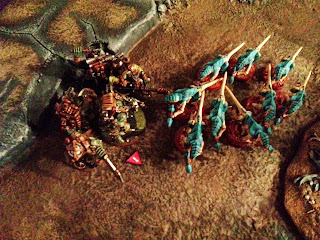 Suddenly I've got a krak Kommando unit behind me who promptly flamed 8 of the Termagants to death. And then the Tervigon suffered 2 wounds too. 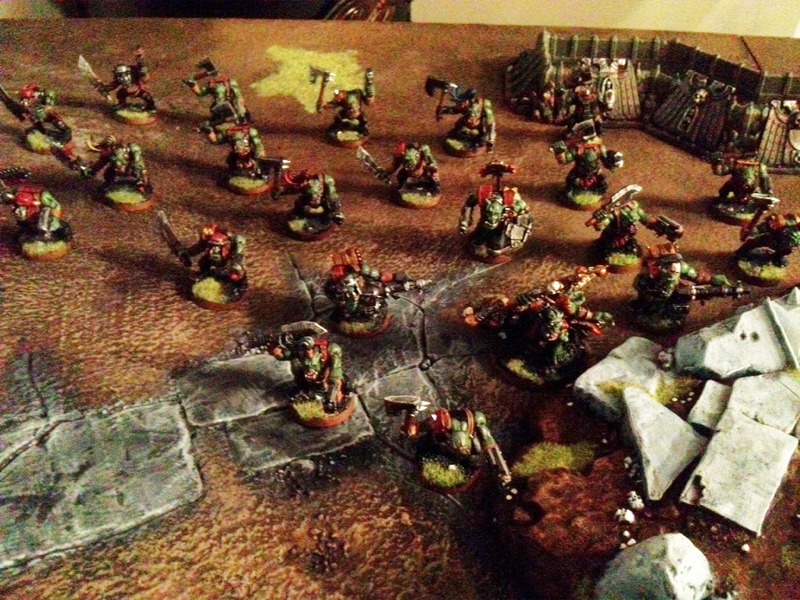 It's raining gribblies! With +1 to my reserves AND re-rolls [though I didn't need them] this was inevitable. 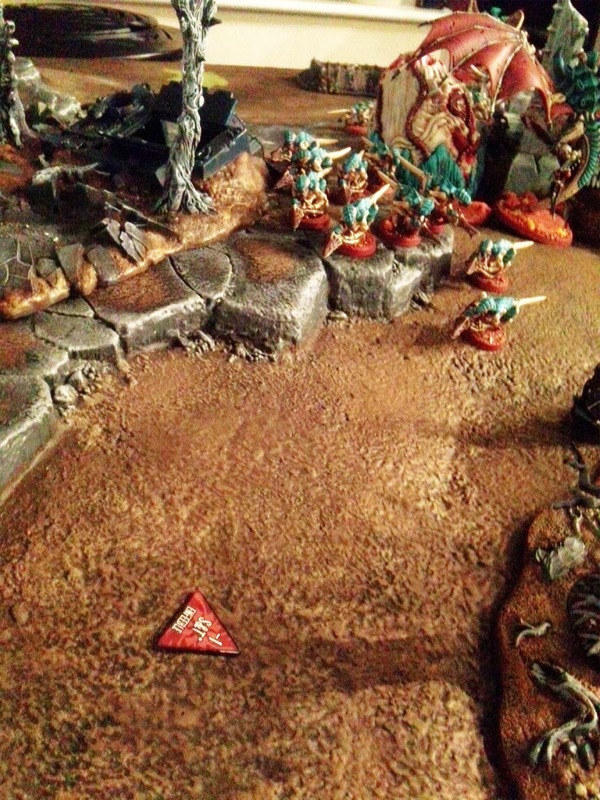 My Mawloc burst forth but due to the cover save from the difficult terrain on the hill only killed 1 Ork. Spore pods landed and Flyrant swooped in. It was shot by the Quad Gun but saved it's 1 wound and kept flapping. 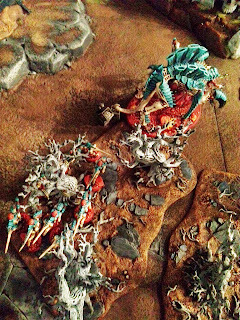 My HQ Flyrant swooped left across the board and together with the 9 newly spawned gaunts and the Tervigon whittled the Kommandos down to 5 and their leader, who took a wound. 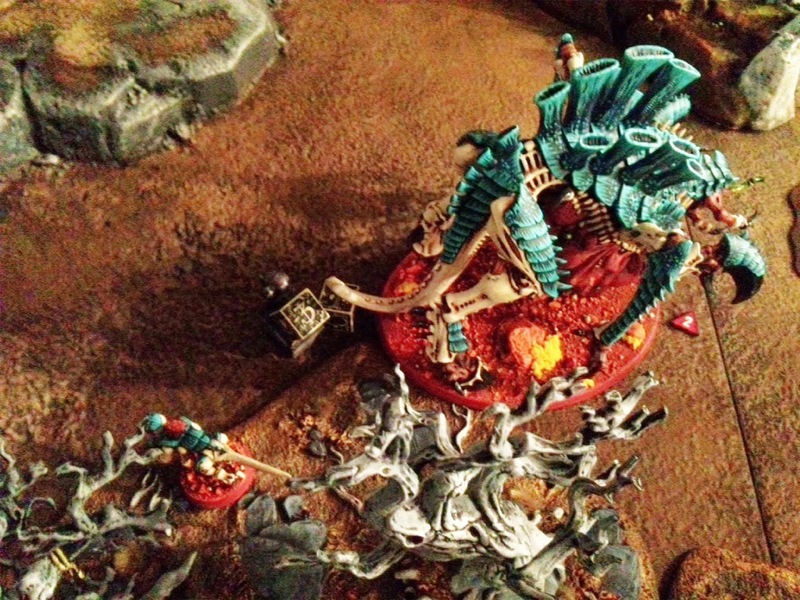 The Tervigon even tried Life Leech on them only to be 'denied'. ...and bit off more than they could chew - killing only one Ork and having 8 of their number chopped up into chunks. 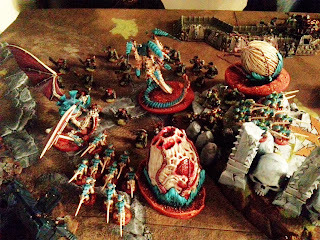 Still no First Blood at this stage but this combat next turn would definitely not end well for the nids. 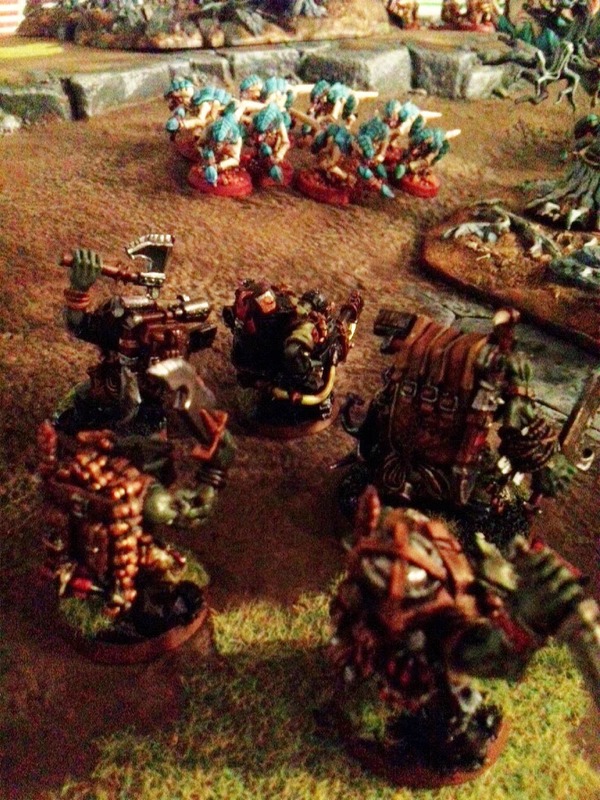 The concentrated deep strike fire routed the big mob of Orks too. 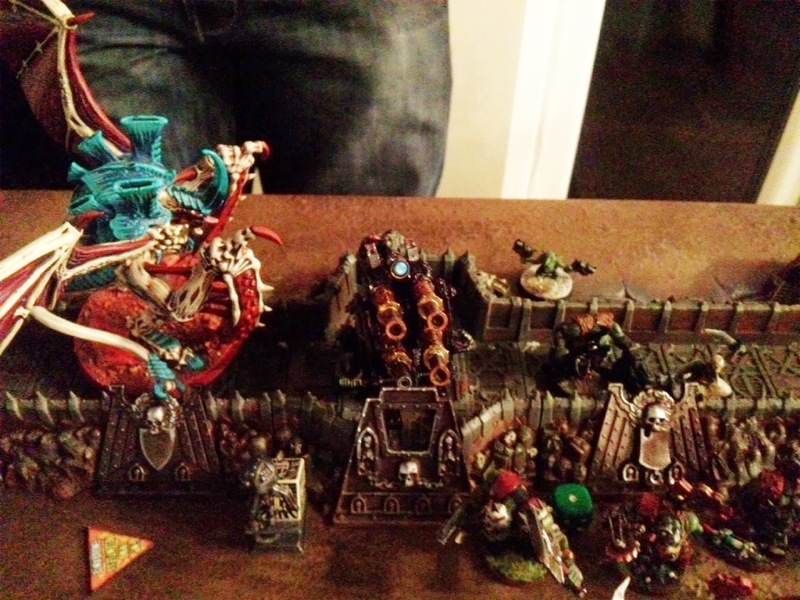 with 4 left and the Weirdboy they too headed for the hills. 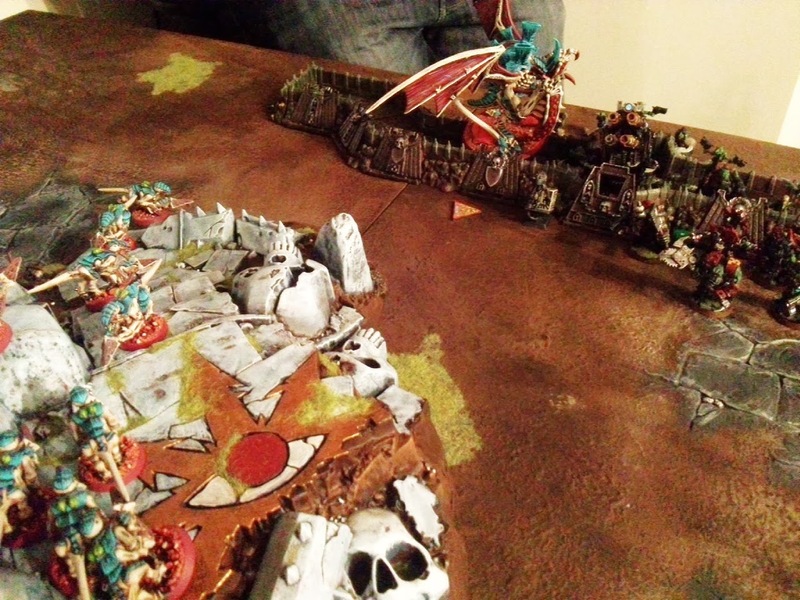 Ben had only decided to take one Dakkajet, I think he'd have been better taking two because this one zoomed on and took out the CC Tervigon putting 11 wounds on it and I failed 4 saves, just enough to kill it off and take the lone remaining spawned gaunt from turn 1. 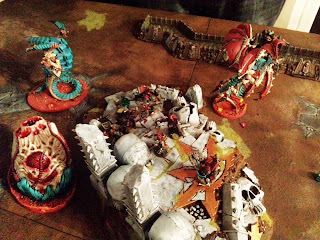 First Blood to Ben and worse still that was my sole remaining spawning Tervigon. 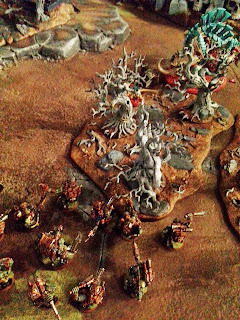 The other spawned gaunt was chopped up in combat. The Weirdboy and his 4 Boyz rallied and then he zapped out of existence only to reappear on my right flank. My Flyrant Enfeebled the Kommandos who were wiped out by the Devgaunts. The Mawloc burrowed. 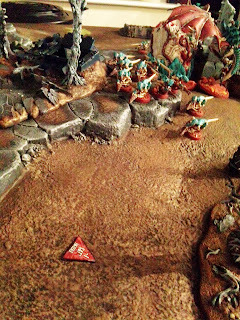 Ghazkull came out from behind the Defence Line and shot up the Spore Pod while my Devgaunts had positioned to stay as far away as possible from him but still hold the objective, even if it was sabotaged. Flyrant two headed behind the Aegis and killed all but 2 or three Gretchin but they steadfastly would not rout. A lot of fire went into the Nobz and Ben decided that Ghazkull would take most of the wounds but the weight of Devourer fire, even with his full save was just too much and he succumbed, giving me Slay the Warlord. But Ghazkull and his Nobz made it just into kombat and slaughtered the Devgaunts even though they were peppered four time with Devourer grubs on overwatch. The remaining Grots shot the Flyrant behind the Defence Line. He got wounded but FnP saved his life, but in doing so he plummeted out of the sky and was wounded but once again FnP saved his life! 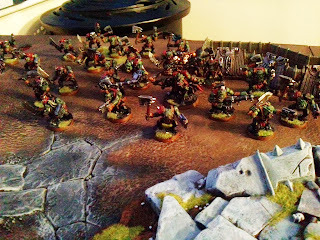 Next turn for the Orks and my Devgaunts heading back to secure my 3pt objective were the next Dakkajet target. 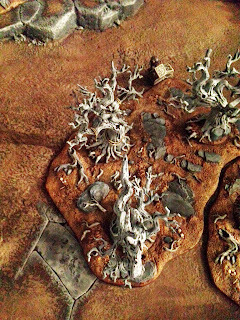 They were routed off the board as they were just out of Synapse range because I'd sent my vanilla Tervigon back to bring the other 14 gaunts out of 'going to ground' which they managed, moved through cover 6" and ran 6" to gain the middle 3pt objective in the vain hope the Tervigon could also hot foot it through the trees and secure this 3 pointer. 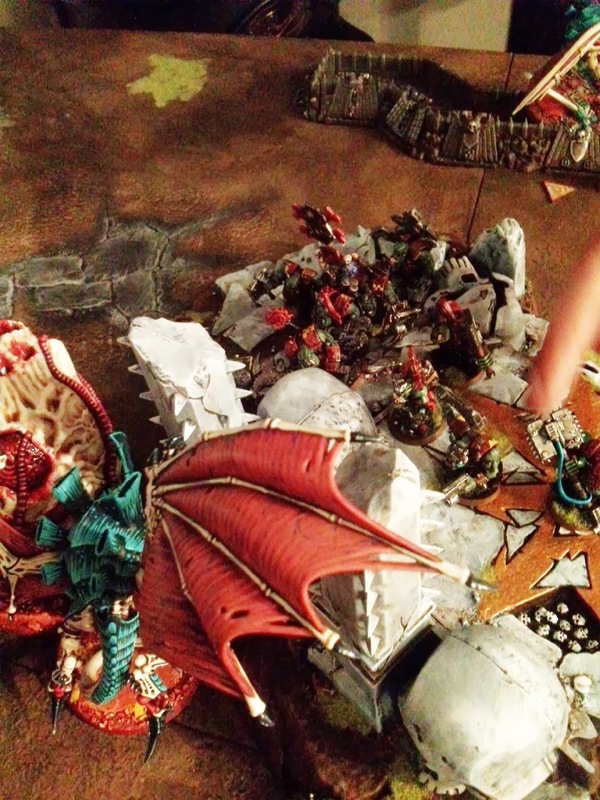 It was not to be but we did put a glance on the Dakkajet and the Weirdboy cast some spell that backfired and killed himself and his remaining boyz. 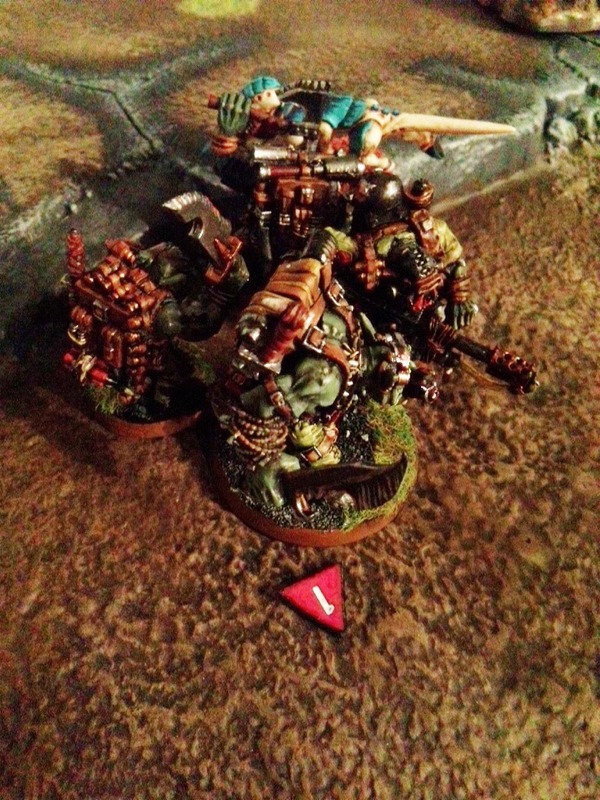 The final nail in the coffin for the Orks was that the Nobz were enfeebled and when the Warlord Flyrant assaulted he instakilled 4 Nobz in combat, given they were now Toughness 3 to his Strength 6. Which resulted in Ben saying I was very 'naughty' and pretty much called it there and then. I honestly didn't think this force would have been as effective as it was. I'm also a bit disappointed it was as brutal a result as it turned out to be. 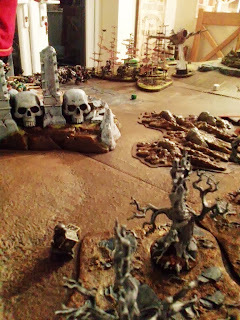 I dropped the Doom so it wasn't painful but 60 Strength 4 shots and 24 twin-linked Strength 6 shots alongside the 12 Strength 6 Ripper Tentacles and the 3 twin-linked Deathspitters on one pod was just insanely good, funny how it didn't work that way on those Dark Eldar ast the Scythe and Teacup. 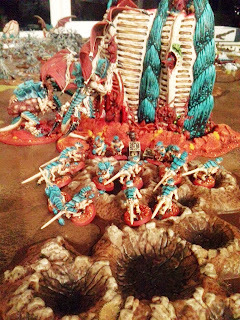 Anyway, if those play test rumours are to be believed I may as well enjoy the Brainleech Worms while I can, if they're going to get rid of THE best load out for Flyrants possible. There was another impression for me that my dice are dodgy again. 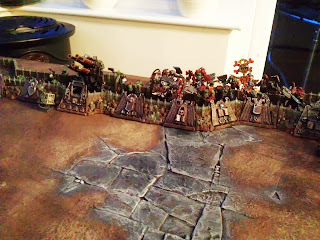 I've played a number of games recently where it just seems to be endless 5s and 6s which worries but then those very same dice will roll 1s and 2s and particularly with the Devgaunts I was statistically hitting the average rolls most of the time so that allayed my fears although occasionally it was above average. What was more noticeable was that I don't think I failed a Feel No Pain roll once. 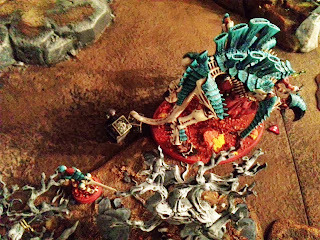 My spare Flyrant went unwounded and even when he did get knocked out of the sky FnP saved him twice! 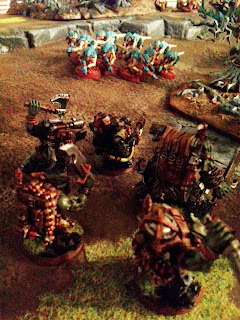 All credit to the Nobz though, they did awesomely and despite the Beta Strike working both Spore Pods and their occupants were destroyed which severely impacted my ability to hold objectives. 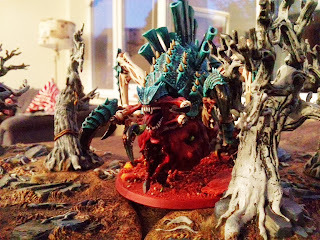 I think for Ben it's become apparent I've honed my nid skills, even when I drop the Doom I've stuff that is just s painful to play against. I think our next match up will either be to see if I can overcome his Necrons again or otherwise I will look at using a list very different, perhaps using the models I don't usually try, like a 20 strong Stealer brood and Hormagaunts. We'll just have to see. Looks like it's was a fun game! Thanks for sharing the pics!